The android-based, PC-streaming handheld drops $50 before launch. Back in January, graphics card manufacturer Nvidia announced that it was leaping into the portable market with the SHIELD. The device has a controller with a five-inche screen, capable of playing android titles and streaming games from a PC. While the device is set to launch on June 27th, Nvidia's making one last change: it's lowering the price down to $299. Along with Microsoft's recent alterations, Nvidia is responding to feedback as well. It made the announcement on its official blog, stating: "Feedback from gamers is why SHIELD's triggers have the perfect throw length. Why SHIELD's buttons have just the right amount of give. Why SHIELD's thumb sticks are so satisfying to flick. Why playing games on SHIELD's pure Android software feels so slick. Now it's time for one more change. We've heard from thousands of gamers that if the price was $299, we'd have a home run. So we're changing the price of SHIELD to $299." Regardless if that's an actual reaction or simple PR-speak, the SHIELD just got that much more affordable. Those who have pre-ordered the device will only be charged $299 when it ships out later this week. 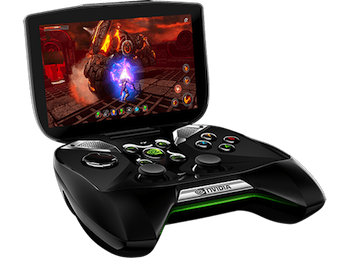 The shield is equipped with fancy Nvidia Tegra 4 chips and will be running Android Jelly Bean software. It will have access to the Google Play store, as well as Nvidia's own TegraZone shop. Gamers with the right hardware on their PC can stream games straight to the handheld via wifi.